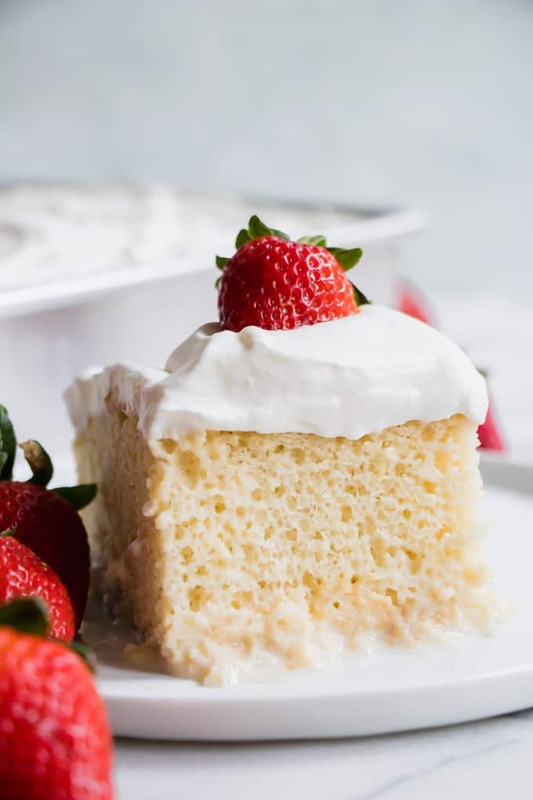 This authentic Tres Leches Cake recipe is simple to recreate. A quick whipping of the egg whites ensures that we get a light airy cake, perfect for soaking up the three milk mixture that will be poured over top. The perfect ending to any meal, especially some Mexican favorites such as: Blackened Shrimp Fajitas or Skinny Chicken Enchiladas. Or if you’re looking for some additional Mexican inspired desserts there’s these Apple Churro Cheesecake Bars. Hey y’all! It’s Serene from House of Yumm back with you today, and I’m so excited to share with you one of my all time FAVORITE dessert recipes. 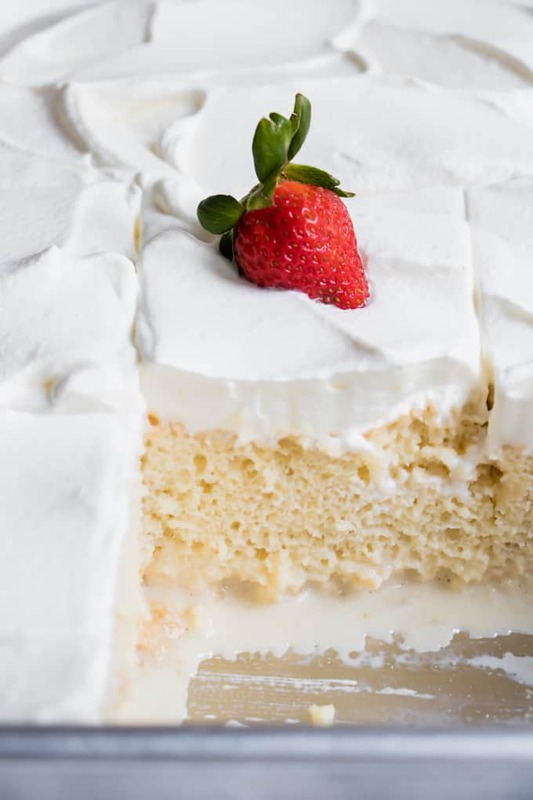 This Tres Leches Cake is such an easy, yet impressive dessert to make. It is the perfect ending to any meal. The cake is light and airy, then drenched in a truly decadent mixture of three milks. After we let the cake soak overnight, we will top with sweet and fluffy whipped cream. The perfect crown for this regal dessert. 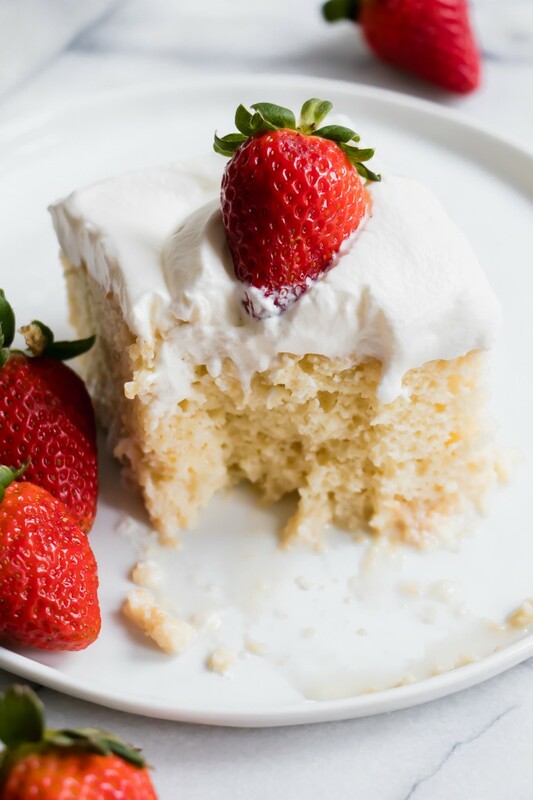 Whenever my husband and I go out for Tex Mex, or a Mexican meal, I never feel complete without ordering a slice of tres leches cake to take home with me. And y’all, this cake is even better when made at home from scratch, so I’m definitely excited to share this recipe with you today! Prepare the cake batter. 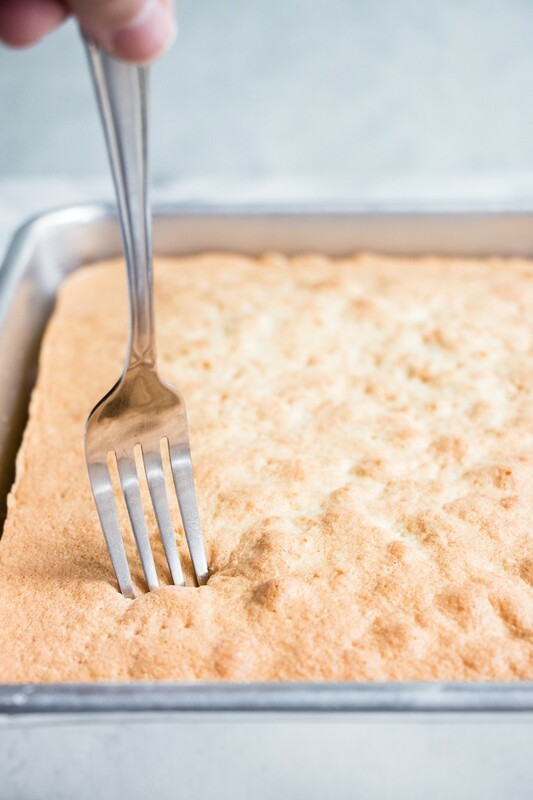 This is a simple cake batter that uses one small trick to ensure a light and airy cake. Separate the egg whites from the yolks and take the extra time to whip the egg whites with a little bit of sugar. Fold the egg whites into the batter to create a fluffy cake batter. This helps the cake soak in the milk mixture. Drench the cake in a 3 milk mixture. Combine the sweetened condensed milk, evaporated milk, and regular milk in a measuring cup. Poke holes in the cake with a fork. Then pour the milk mixture over the top of the cake. Cover and chill. This is the point where we need to let the cake soak in all that delicious milk. The cake needs to chill in the fridge and soak for at least 4 hours, I prefer overnight. This ensures the cake soaks up as much of the milk as possible. Top with whipped cream. After the cake has soaked and you are ready to serve, whip up some heavy cream and spread it over the top of the cake. 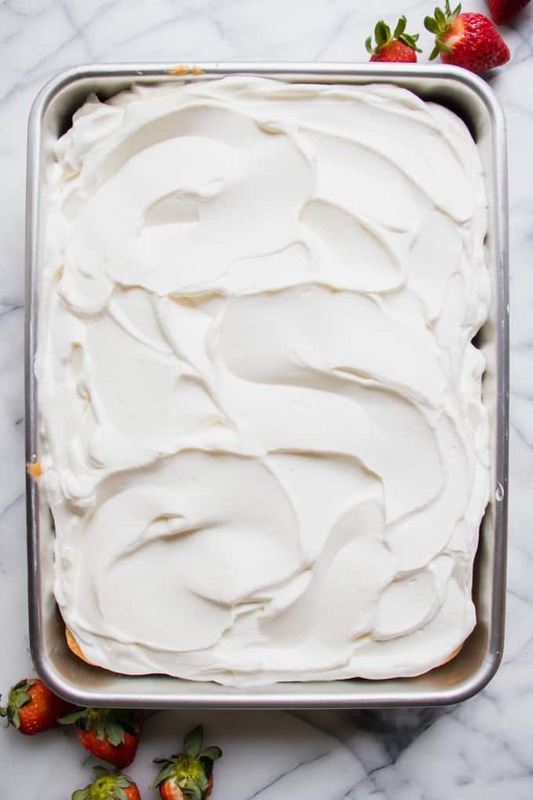 This tres leches cake doesn’t use frosting, but a light and fluffy whipped cream topping instead. At this point you can give a sprinkle of cinnamon, or top with some fresh fruit if desired right before serving. What milks are used in Tres Leches Cake? 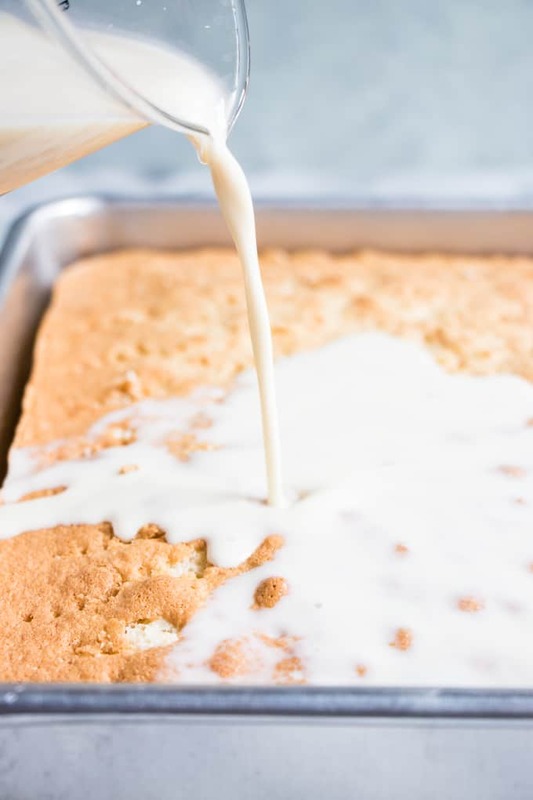 The milks used in this tres leches cake recipe are sweetened condensed milk, evaporated milk, and regular milk (can be whole milk or 2%). Some recipes will substitute heavy cream or half and half in place of the milk. I don’t find it necessary in this recipe, since it’s decadent enough without it. How do you store Tres Leches cake? Due to the milks in the cake, this tres leches cake does need to be stored in the refrigerator. Cover the cake, to help keep in the moisture, and store in the fridge. How long does Tres Leches cake keep for? This cake can be stored in the fridge and saved for up to 4 days. It is best when eaten within the first 48 hours. After the 4 day, the cake does become slightly soggy. Can I freeze Tres Leches cake? Yes!! You can freeze Tres Leches cake. BUT you can only freeze the actual cake. Before you drench it with the milk mixture. So after the cake has been baked, you can freeze it like you would any cake. Then when you are ready to use, bring to room temperature, drench with the milks, let it soak overnight, then top with the whipped cream. Grease a 9x13 cake pan. Pour the cake batter into the cake pan. Bake for about 30 minutes or until the top of the cake is golden and a toothpick inserted in the center of the cake comes out clean. For the Topping is this (1 pint 2 cups heavy whipping cream) actually 1 pint + 2 cups, or just 1 pint?